Where the Conveyor Food Metal Detector is used? This machine is widely used in the detection of meat, mushrooms, candy, drinks, food, fruits and, vegetables, dairy products, aquatic products, health products, additives and flavorings and other food-ferrous Metals and non-ferrous metal impurities. Besides it can also be used for the detection of metallic impurities inchemicals, rubber, plastics, textiles, leather, chemical fiber, toys as well as for the detection of metallic impurities in pharmaceuticals, health products, biological products, cosmetics, gifts, packaging, papers, and so on. What is the definition of the conveyor food metal detector and where the food metal detector is widely used? Come here www.jkdcsecurity.com and click into the relevant category and read more information about it, you will know more functions about the powerful device. Nobody could refuse the delicious food. Especially for the beautiful cake and the goluptious bread, however, the temptation is hard to resist. It is so sweet and delicious. You just want to enjoy and eat it. Before you eat them, the safety of that food is very important for you. About delicious food, children like to eating, Youngman like eating, middle aged person like eating it and old people also like to eat it. When you are on your birthday party, the cake is necessary, when the valentine's day, you can buy a box of chocolates for your lover to show your love, when you get married, you can have delicious food with all your friends. In the happy life, you can’t live without food. 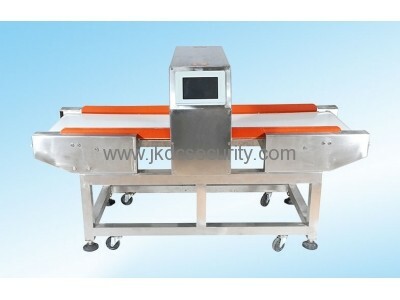 It is so important to buy one conveyor food metal detector for keeping food safety. And this Professional Conveyor Belt Food Metal Detector without any doubt will be your best choice here from our online store. Then where the food metal detector is widely used?